What Do You Want to Know About The 2019 Range Rover Velar S? 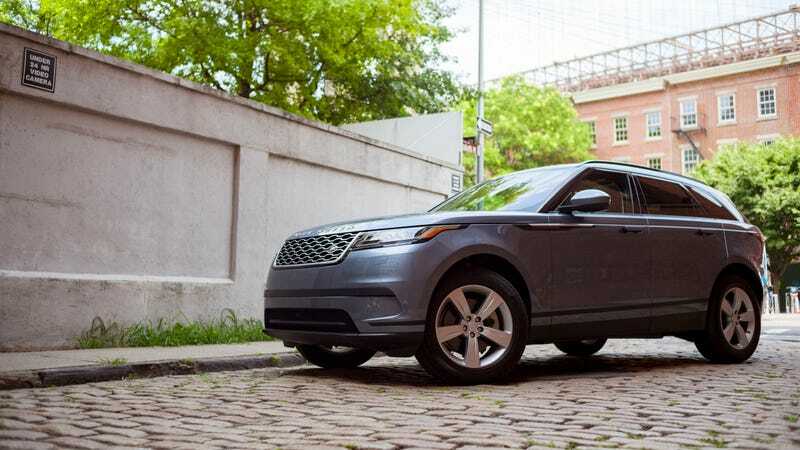 It’s a rainy Friday night here in New York City, but the weekend is supposed to be sunny and warm, and I’m looking forward to getting to know the Range Rover Velar we’ve got for a few days a little better. Maybe you can help? I’ll be tooling around town in a Velar S for a few days. It’s blue. Sometimes it’s hard to tell in It looks pretty good, maybe save for the unfortunate wheel choice on the press car I’ve got pictured above. Is there anything you’re dying to know? Give me a shout in the comments below and look forward to a review later next week, where I’ll probably sort of answer your questions and forget to come back to this one and reply. Don’t let that happen. Otherwise, have a great weekend. This post has been edited to clarify that, even though I was expecting delivery of an R-Dynamic trim model, it’s just an S. Some slight confusion, and we regret the error.